4 Differences Between High School and College Classes — You Got Into Where? Don’t be nervous to start classes at college! 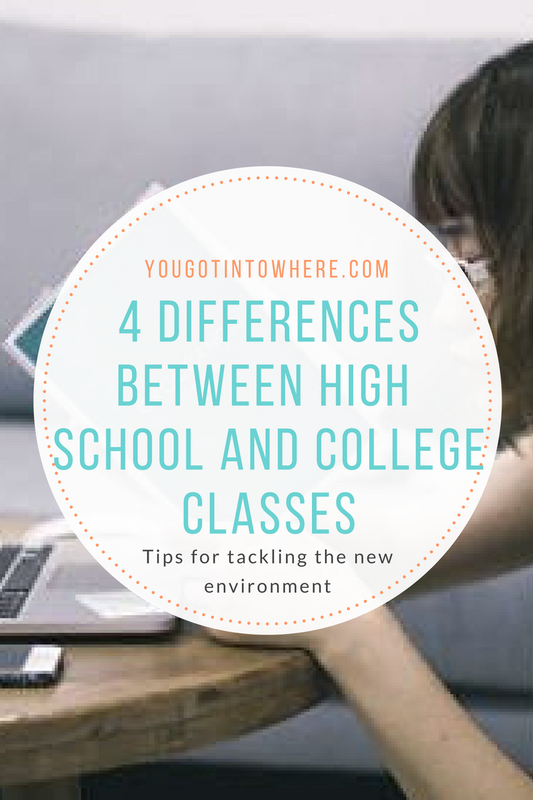 Here is a list of 4 differences between high school and college classes to give you some expectations before you begin. Going to college is the start of a new chapter in your life, as well as in your academic career. It is an exciting time, but it is easy to forget that you actually have to go to classes. These five points should ease any of your nerves about college classes and give you an idea of what to expect when you go to college. Especially if you go to a large university with large lecture halls, professors might not know if you miss class. Attendance is considered part of participation, but often enough, professors do not take attendance. However, in high school, roll is typically called in home room and passed along to your other teachers. Thus, in college, the main reason you show you is your willingness to learn and participate. In high school, too many tardies or absences might lead to detention or suspension, so you are forced to attend and do so promptly. In college, you need to have the responsibility to recognize your need to wake up and go to class. Trust me, missing one class in college could be detrimental to your grade something important is taught in that class. Showing up to class is one thing, and participating is another. Participation is typically factored into your final grade in a class. My tip is to raise your hand whenever you know an answer, and at least once per class. Also, while note-taking is not considered participation, it is essential for actually absorbing information and, of course, studying for exams. In high school, participation might be important in certain classes, but showing up with the correct materials and handing in work often covers it. High school teachers also usually have PowerPoint presentations with certain notes for you to take, or hand out study guides for tests, containing particular notes. In college, however, you are usually the one to decide what is important enough to write down. None of my professors during my first semester used PowerPoints or study guides; they lectured. Learning to take good notes is a part of college, as it is a vital part of studying and, altogether, learning. What should also be noted is that you cover entire chapters during college classes, so you should take it upon yourself to try your best to attend every class. Missing a single class could mean missing the most confusing topic of the course. High school teachers usually try to keep their relationship with their students at a professional level. While this remains true in college, professors and students can converse simply as two adults. What I found surprising in college was that professors often introduce themselves by their first name, not as “Mr.” or “Mrs.” Also, I found it interesting that professors sometimes even make plans with their students outside the classroom. Two of my friends had a professor who required that you go to lunch with her. While studying abroad in Rome Italy, I, along with other students in my Italian I class, went to a local cafe with my professor, where we ordered in Italian and spent time with our professor. My philosophy professor did not act as though he had to teach us about different philosophers’ theories. Rather, we read through the texts and came up with ideas as a class. Professors are not intimidating! You might just be in for good friendships with your professors in college, especially if your university offers small classes. In high school, teachers might hand out a syllabus at the beginning of the year, but even if they do, they usually don’t follow it. In college, you will get a syllabus for each and every one of your classes, and I am telling you right now that you cannot lose it. The syllabus will have every assignment for that class, as well as descriptions of what you will be doing each time the class meets. My tip is to write each paper and exam due date in your planner on the day you get your syllabus. At this time, you probably have no other homework, so you might as well prepare your planner now! Also, I recommend keeping your syllabi in one folder so that it is easy for you to keep track of them. Here are a few of my personal tips for signing up for and taking college classes. Use ratemyprofessor.com when choosing classes. I recommend utilizing this website and typing in the names of the professors teaching classes you might take before signing up for them. You can find ratings completed by students who had these professors in the past. Professors are rated on level of difficulty, as well as overall quality, which includes various factors. Trust me, this website is a lifesaver when it comes to choosing classes. It can save you from the worst class of your life! Choose classes outside of your major! In college, there so many different types of classes are offered. Take electives that interest you, not just classes pertaining to your major. Doing so can really add to your academic experience at your university and give you a well-rounded education. Go to your professor’s office hours! Professors will tell you at the beginning of the semester when they are available for meeting with you each week, either by appointment or walk-in, and these times will be on your syllabus. Professors love it when students come in to ask questions, so do not be intimidated. If you are confused about a topic in the class, take advantage of office hours to show the professor that you are trying to improve. You never know, he or she just might boost your participation grade. Overall, college classes should not be feared! Know that every class you have taken up until college begins have prepared you for these courses. Be confident in your ability to succeed. Work hard, and you will excel!